New book explores current economic problems, social and psychological stigmas. The struggles of the African American community throughout the history of the United States are no secret. According to Sebastain Cor-Dova, the negative effects of social and economic disparities continue to impact and shape modern society. 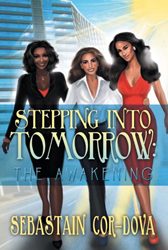 Cor-Dova tackles the tough subjects of race, stereotypes, socio-economic standings and the power of thought in his new book “Stepping Into Tomorrow: The Awakening”. The work functions as a commentary on the current relationships between African Americans and society. Through the perspectives of three young professional women in Chicago, the novel explores psychological stereotypes, socio-economic issues and concerns regarding the future. “Without any sort of significant change on a major scale, blacks will continue to remain at the bottom of the social, political, economic and educational pecking order,” said Cor-Dova. Cor-Dova has spent more than 40 years researching, discussing and observing the current condition of many people across different classes and backgrounds in the African American community. For more information, please visit bookstore.xlibris.com. Available at bookstore.xlibris.com, amazon.com and barnesandnoble.com. Sebastain Cor-Dova grew up in Southern California and is a graduate of California State University Los Angeles. He served in the United States Army during the Vietnam War and as a civil servant in Iraq in 2005. He is now retired from Federal Government after more than 30 years of service. Cor-Dova currently lives in Virginia with his family.